Yikes, can you believe that it is already October 21? Time to get a start on Christmas cards. I have about 10 or so made. Not nearly enough that's for sure. That's where my samples will be headed each week for awhile. Today, I used a new die Christmas Tree Cupcake, for my sample card. I wanted to show a card that would be easy to mass produce using this new die. So let's get started with some details on how I created my card. Step 1: Since this is a Christmas cupcake, I knew I was going to use red and green for the cupcake itself. So I checked my cardstock and patterned papers for a Christmas theme of red and green. I found this dotted paper that I thought would look good as a background. Dots and stripes always work for me for Christmas. Step 2: Once I had the shades of red and green chosen, I was ready to cut my cupcake image. As with all CottageCutz dies, this has such detail with it. I really like how cute this image is. Step 3: I wanted to have the cupcake framed inside a circle die. I used the Nested Stitched Doily die and cut in the cherry red cardstock. 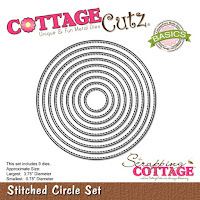 I also used the stitched circle die (3rd largest) as a layering piece and cut this in kraft cardstock. I adhered the circles together with double sided tape and then stamped my "Sweet Greetings"sentiment. Step 4: I started the assembly of my card. I decided that I wanted to break up all the dots on the background panel. So, I used a 3/4" x 4 1/8" piece of the green cardstock and layered some kraft ribbon over that. It will be just enough once my circles are layered on top. Attached the cupcake to the circles with dimensional adhesive. There are little circle ornaments that are part of this die that I forgot to attach earlier. I cut them in white, green and red cardstock. I scattered the extras on the image panel for added interest. To complete my card, I attached the image panel to the red card base. I thought it just needed something else so I added a small bow made with the kraft ribbon. It finished my card off nicely. I hope I have given you some inspiration on a way to use the new Christmas Cupcake die. Well, that's it for me for this week. See you next Saturday. How sweet and beautiful this card is. Adorable Christmas cupcake love the mix of papers and your sweet little bow! Super card, Mary! I love the deep red cardstock you used for your base, and that cupcake looks good enough to eat!!! Cute card. The polka dot paper is perfect for the dots ("sprinkles') on the cupcake tree.